A member of staff will take all Reception class children over to their classrooms and ensure they have gone in safely with their teacher. Children in Years 1 and 2 will be let into school through the connecting door and supervised by practitioners to ensure children go straight to their classroom. Children in Reception class are collected by a ‘Kidz Around the Clock’ club practitioner every night. All children in Year 1 & 2 meet in the school hall where they will be checked against a register and taken into club. Snack time takes place between 4:15pm & 5:00pm at an additional cost of 50p. During this time, children will be offered toast and fruit or yoghurt with a drink. 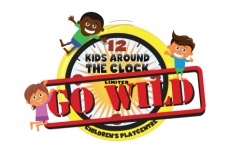 ‘Go Wild’ club is open for childcare during some of the school holidays. We operate during October half term, February half term, 1 week at Easter and the first 2 weeks of the summer holiday. Booking forms are available a month before hand to enable parents to register, book and pay for sessions before the week begins and all booked sessions must be paid for in full and in advance and are non-refundable. ‘Go Wild’ is different to nursery and pre-school sessions. There are many long days out and about, trips to the park etc, and therefore is only suitable for children age 3 years old up to 9 years old. Parents are expected to provide a packed lunch, snack and drinks for children booked in.